The first month has been focused on removal and preparation, which can feel simultaneously satisfying and disheartening. We're taking a step backward before we can really start moving forward. Before we can really start building out things like cabinets and desks and installing fancy lighting, we have to get the foundation right. And to get to the foundation, we have get the non-essential bits and pieces out of the way. The first to go were the rub rails, emblems, clearance lights, tail lights, and battery boxes. Some of these pieces will be cleaned and restored before being reinstalled. Others will not be put back in place, in an effort to streamline the look of the finished exterior. Various bits and pieces removed and set aside for cleaning and restoration later. The five awnings removed. Behind them to the left of the frame are the gravel guards, the "sunglasses" (that protect the front panoramic window), the battery boxes, and the propane tank cover. The main goal for all of this removal is to get unfettered access to the outside skin to make polishing it easier. 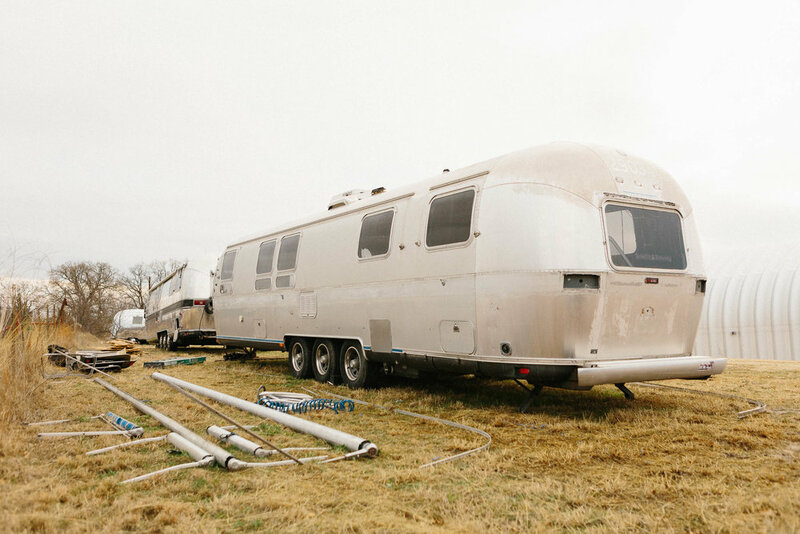 Having already partially polished our first Airstream, we knew that trying to navigate a bulky polisher under and around awnings and trim pieces is a pain. So with the obstacles out of the way, it then came time to remove the accumulated grime and dirt that has baked onto the roof. We brushed the roof with a bristle brush and OxyClean which was effective, but not quite as effective as the pressure washer. Neither approaches were very fast - it still took both of us several hours of standing on ladders. Before we can polish, we had to remove the clear coat. On our first Airstream, we used the 5-gallon jug of paint stripper available from Vintage Trailer Supply, but we only needed about half of it and gave the rest to our neighbors who were getting ready to start the process. This time around we're just using Citi-Strip, which is available either from Home Depot or Amazon.com and comes in smaller containers. It seems like it should not be legal for paint stripper to look and smell like some kind of bizarre orange yogurt candy, but it is surprisingly pleasant to work with. While the Citri-Strip did fine on the clear coat, the stripe needed something a little more intense. Referring again to past experience with this whole process on the last Airstream, I dug an old can of Klean-Strip Aircraft Paint Remover out of the truck, which worked well the last time around, probably because it is considerably more caustic and corrosive than the Citri-Strip. You can get this stuff at your local auto parts store. After the first coat, you'll see the vinyl start to bubble up. I was able to get almost the entire street-side stripe off in a single piece by pulling gently and consistently across the full width of the sheet. Afterwards, I hit the adhesive layer underneath with another coat of stripper, waited a few minutes, and then used a plastic putty knife to gently scrape off the residue. It slid right off. With all of this removal, the trailer looks ultimately worse than when we got it, which is the disheartening part of the way this project has started. But we know it's all going to start coming together. The next step is to start polishing and then we get to start putting the outside back together before ultimately moving to the inside.